I recently switched​ weather stations from Atlantic City airport to my own Netatmo PWS. It shows correctly on the web, but when I use the Android app it still shows Atlantic City. 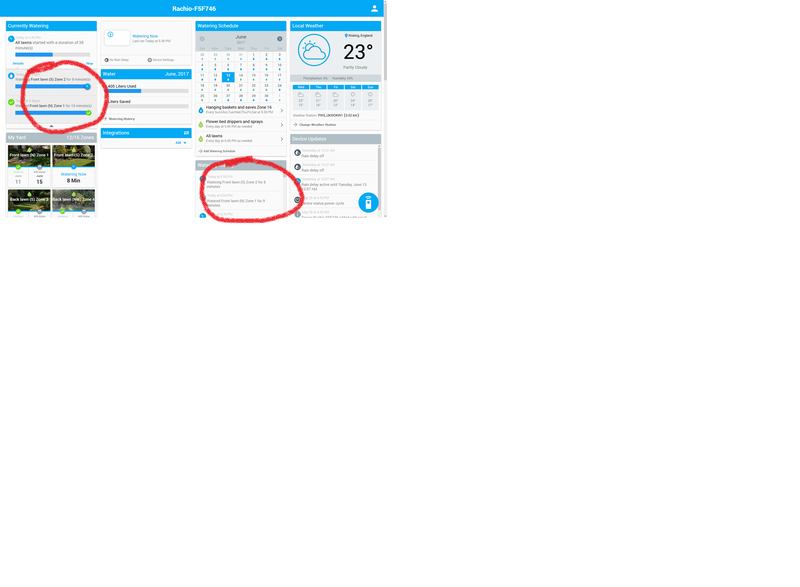 If I click to change weather station in app, it shows the correct weather station being my PWS. Once I click cancel, it goes back to showing AC. Seems to be a bug in the app. See screenshots below. First screen shot is from the Android app showing the wrong weather station. Second is the web app showing the correct one. I don’t know how this is affecting my scheduling as you can see they are reporting two different temperatures and wind. Click on each to see the full screenshot. Do you still see this behavior if you force close your android app and then re-open it? Very strange @Jaycamp, I am going to have on of our android users in house try to replicate this for me. Will report back. 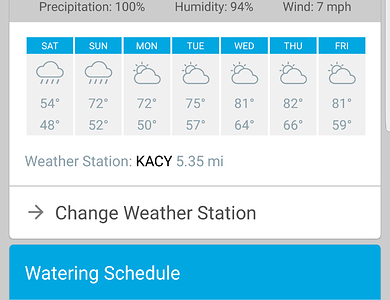 I was able to correct it by going into the app and selecting a different weather station, saving it and then going back in and selecting my PWS and saving. 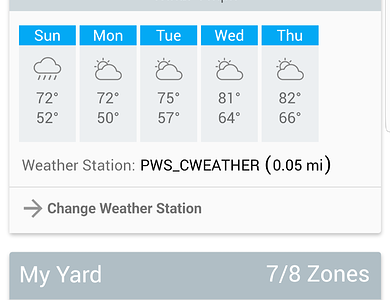 If you could tell the in house people it seems that if you select a new weather station on the web app, the Android app is not updating all the way when it syncs. It seems to know the correct one when you go to change it, but is not displaying the correct one or the weather being reported. I’ve just had this same problem. It seems there is still an issue if one changes the station on the browser and Android app not picking it up. Do you think it could be time related? How long does the Android app stay out of sync? I will do some testing on my end, but wondering if you have a guesstimate! I don’t think it’s time related. I changed stations on the PC and the display remained incorrect on the app for a couple of days until I looked into it and found the thread on this site which explained how to fix it (re-change it on the app to another station and then back to the desired one). I don’t have a length of time therefore but since it persisted for several days I suspect it’s permanent. Just found another inconsistency in the PC app. The length of watering reported in the Currently Watering section is different from that in the Watering History report by a minute for each zone (see screenshot below). Another Bug? rounding/truncation, especially when using Smart Cycle. I had the same question last year. Alright- update on these issues. First the weather station in the android app. We have confirmed that this is a bug in the Android app, and we have reported it to our development. However, if it’s any consolation, this is strictly a display issue, and the weather station your system is using is whatever you set it to. I have a hunch it may be a caching issue, if you have any interest in clearing your app cache I would be really interested to hear if that resolves it! Second is the usage. I’m a little perplexed on this one, and cannot seem to replicate it. I’m curious if it has to do with unit conversion/international issues. Are you still seeing such a large discrepancy @WokingWounded? And finally, the minute difference. @Linn is spot on, this is a rounding issue, and actually shows up a couple other places (notification emails as an example). This has been reported, and we are working to create a rounding “standard” so we don’t continue to run into this. I hope this helps! Thanks @mckynzee. Item 1 that’s fine, the work round works and and it’s not that critical that I can’t wait for a fix in due course. Usage is still broke. 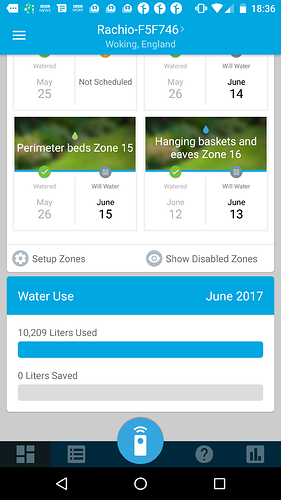 After today’s watering cycle the android app is showing 12,927 liters used on the summary page and 19,514 on the chart page. The browser (Firefox on W10 Pro) is still showing 995 on the summary but shows 19,514 on the chart. Looking at the chart I think 19,514 is usage to date this year (ie since 25 May) and 12,927 is the June usage to date. No idea what 995 is but it hasn’t changed for the last few days. And finally the minute difference. It’s not critical but inconsistencies like that can undermine confidence in the system as a whole (if that’s wrong…what else is?) so getting it fixed is a sensible idea. It’s early in the morning on 15 June after a fairly big 14 June watering cycle. The app is now showing 16,252 liters used in June (which is consistent with the Watering History chart in the browser) and the browser summary is still stuck on 995 liters June usage. Both browser and app show 22,839 liters usage year to date. I’m curious if it’s a caching issue, can you clear your cache, log out, and then log back in and see if that resolves the issue? Did as you suggested. Still showing 995 liters consumption on the browser Water summary I’m afraid. Would you mind DM’ing me your Rachio username?